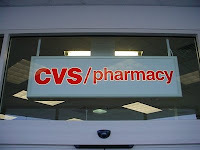 Here are the best deals I see at CVS this week. I will certainly be going in for the Crest Pro-Health Toothpaste and Rinse (a Money Maker after either coupon and your ECBs) and the Olay Wet Cloths are great for the Olay Mail in Rebate HERE. If you need make up the CoverGirl foundation and/or pressed powder will come out to be FREE after using the free product coupon & the $1 off coupon (one on each item). And don't forget some FREE Aussie & FREE Colgate. Thanks to Michelle at I Heart Saving Money for the preview. You can checkout her post HERE.